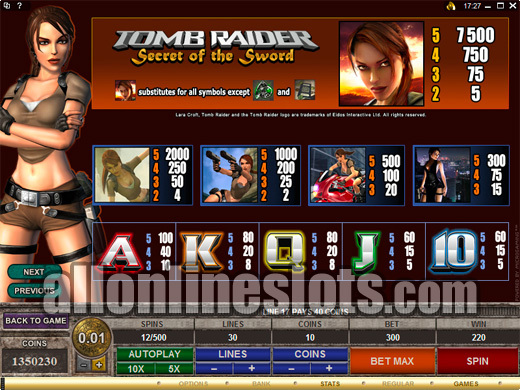 Tomb Raider Secret of the Sword follows up on the success of the original Tomb Raider slot by Microgaming. 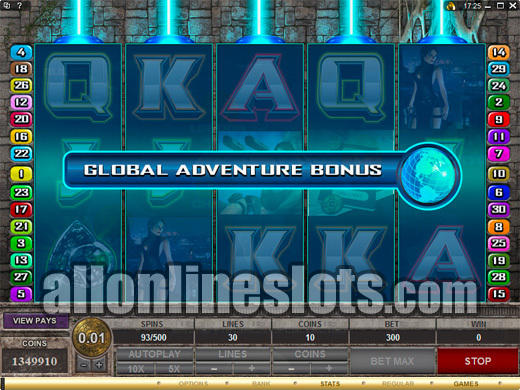 This version is much more feature packed with free spins and a multi-stage pick a box feature. It also has a special Super Mode. Lara Croft is back in what we can only describe as one of the best video slots we have see both online and at land-based casinos. While this might seem like a big call, Tomb Raider - Secret of the Sword really delivers with big jackpots and a range of new bonus features. Microgaming have really stepped things up a notch with this game. 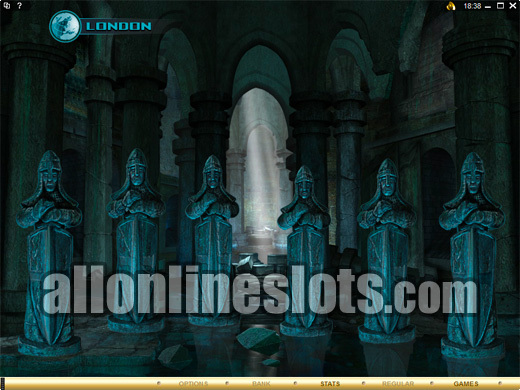 It uses the 5 reel, 30 line format and has a max bet of 10 credits per line. You can play in a range of coin sizes with a one cent minimum. This makes for a $3 max at the penny coin size. We suggest playing all lines. You do not necessarily need to play 10 coins per line but your wins will be bigger if you do. Tomb Raider - Secret of the Sword is a feature packed game. Three features in fact. 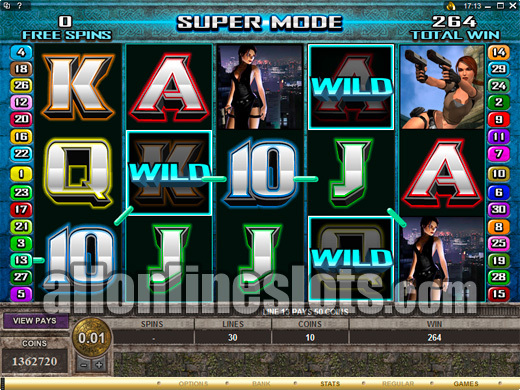 You have a free spin bonus game with cascading symbols, a Super Mode and a multi-stage pick a box bonus. Before we discuss these bonus games lets take a look at the base game. 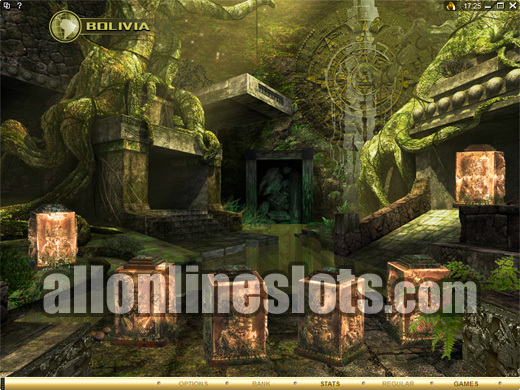 The top jackpot is 7500 coins for five wild Lara symbols. This pays 75,000 coins if you are playing max bet. The next four highest pays are all for the different Lara Croft symbols. 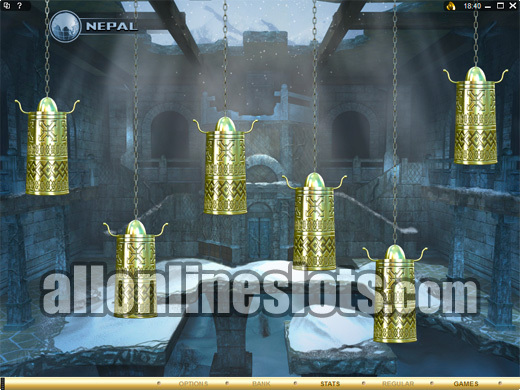 Five climbing Lara symbols pay 2000 coins while five shooting Lara symbols pay 1000 coins. The next two pays are 500 and 300 coins for five Lara's riding or standing. All of these wins can be multiplied by up to 10 depending on your line bet. The 10, J, Q, K and A make up the lower pays. The first bonus is the Super Mode. This is randomly triggered at the end of any paid spin. You win 5 free games which might seem small but there is a twist. At the end of any free game Lara Croft can appear to transform any symbol into a wild symbol. The wild then remains in position for the remaining free games. This means that if you get luck you will have more wilds on the screen and in turn more chances of hitting not only the five wild combination but also hitting five of a kind wins. The second bonus is the free spin feature activated by hitting three, four or five scatters anywhere on the reels. You then win 10 free spins with a 1X multiplier. The free games have a great twist. At the top of the reels you will see five multipliers ranging from X2 to X5. On the free spins any winning combination is paid and then the symbols explode. These remaining symbols drop and new symbols are added to the reels. Each time you have a consecutive win on the cascade your multiplier increases. up to a maximum of times five. 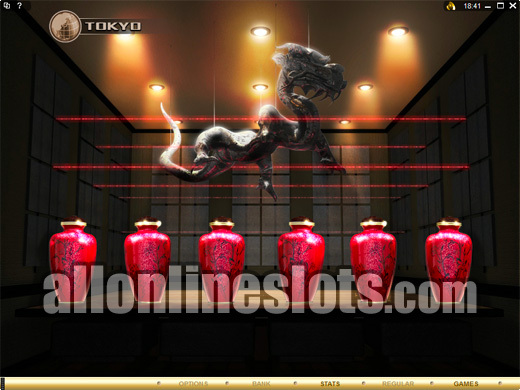 If you are lucky enough to get five wild symbols on the fifth cascade you win the highest possible jackpot of 375,000 coins. Next up is the Global Adventure Bonus. The passport symbols are the key to activating this. Every time you get a passport symbol on the middle line you activate that particular reel. This is indicated by an aqua line appearing around the reel. You need to activate all five reels to progress to the bonus stage. The great thing with this is that if you manage to activate four reels but decide that you want to take a break you can do so and return any time later to find the activated reels still there. 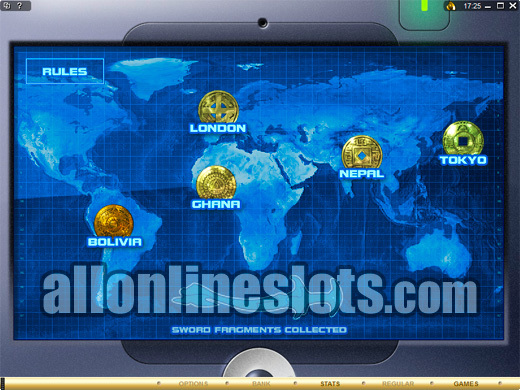 This is one feature of Secret of the Sword which really works well online but would not work in land-based casinos. Once you have activated the Global Adventure bonus you move on to a location selection screen (View Screenshot). Here you get to choose from one of five locations around the world. These are London, Tokyo, Nepal, Ghana and Bolivia. You get select one to move to that location. All of the locations feature the same pick a box bonus. Your aim is to find parts of the hidden sword. Each level contains two trap symbols, random prizes and one piece of the sword. Picking two trap symbols ends the bonus. Finding the sword returns you to the locations selection screen where you can pick another location to continue search for the sword. Also on the bonus stage are Hidden Treasure bonuses. If you pick a random prize and the hidden selection bonus appears you get three question mark symbols. Pick one to reveal another random prize, a X2 multiplier or a Win All symbols which clears your current level and awards all prizes and a part of the sword. There is also a shootout bonus stage available here. If you manage to find all of the pieces of the sword you get an additional bonus pay and the feature ends (View Screenshot). Overall this is the most impressive bonus stage we have seen online. The graphics are great and it really has a great Tomb Raider feel. 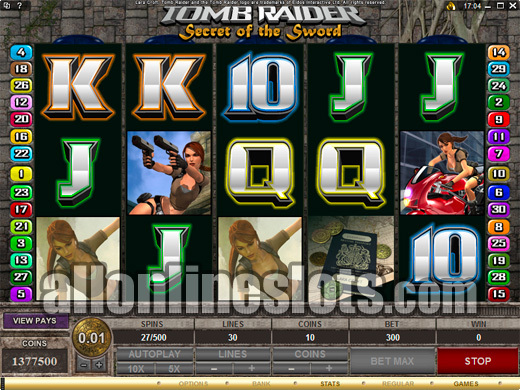 Tomb Raider - Secret of the Sword is a brilliant example of just how good online slot games have become. It has superb graphics, atmospheric sounds and so many bonus features and twists that it really keeps you on the edge of your seat. 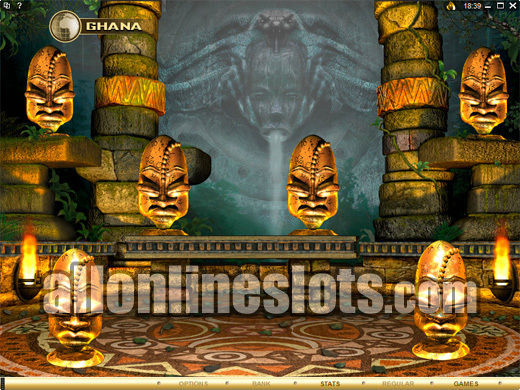 If you are a fan of slot machines then this game is a must play.